In 24 hours I well be racing for the Everest Challenge. The weather looks very nice, especially compared with last year. Saturday, 48 degrees when we start, high of 87 in Bishop, with zero chance of rain. Similar for Sunday, but a bit warmer. Last night I went through my estimated times again so I have some benchmark to use during each of the days. This table compares my two back to back training rides last weekend, plus the 300 Warriors ride, plus the estimated best times for the Everest Challenge that I discussed in a prior blog entry. My estimated best times seems about right considering the climbing in feet/mile is much higher. I will set my target to come in under 15 hours total for the two days. If successful that should put me midway amongst the Master 55+ field, which I would be very happy with. After I finish this race, then I can turn my attention to getting ready for the Furnace Creek 508, which I have coming up in two weeks from now. I have stayed on my training plan for the last 17 weeks. I have also been getting in some speed work. I hope I am ready. I decided to take both bikes and use the one with a triple as a backup, or maybe ride it the second day, depending on how I feel after Day 1. All the training is over and we leave tomorrow for Bishop. The Everest Challenge will start 48 hours from now. It will be cold at the start, but should be nice weather during most of the day, according to the latest forecast. I am going to take off the next two days, except for many a very short and easy ride to make sure I have my new bike adjusted right after swapping back to the Durace derailleur. I recall having a similar discussion before I did the Devil Mountain Double. The issue has always been that my new bike is lighter and handles much better than my old bike. But the new bike has a double and the old one a triple. When I get into these events that require a lot of climbing, it is a dilemma. For the Devil Mountain Double I ended up using the new bike and just ground it out on the later steep climbs. But the Everest Challenge has climbs that are steeper yet and also it has two days of back to back. I had already decided to use my old bike on the 2nd day, then maybe I would just take it alone for both days. I had put on new wheels and a new Durace crank on the old bike to get it lighter so now the difference is only 1 lb. But I feel much more comfortable descending on the new bike. When I was doing the Metcalf Mauler last night I asked Chuck how many speed his bike is because he has not only a compact crank but a mountain bike gear on the rear. He said it was 10 speed, but I know Shimano doesn’t make a 10 speed mountain bike cassette. He said he special ordered one and had a spare (brand new) I could borrow. I spent a couple hours this morning to take the Shimano XT derailleur off my mountain bike on switch it with the Durace derailuer on my new road bike, then I swapped the cassette. It took me a while to get things adjusted because the stops were way off. I think I have it working okay, without even lengthening the chain. I just have to be careful to not cross chain with the big chain ring and the largest cassette, which is a 34. I would like to go the compact route, but this will for the Everest Challenge and it didn’t cost me anything, just some of my time and very greasy hands. I did a a test ride up Henry Coe tonight. I had taken it off my mountain bike and did not realize it shifted in reverse, which mean when I shifted on my road bike it moved the opposite direction on the rear cassette from what I expected. That alone was reason to not go this route. It also was not smooth shifting. So when I got home after the ride I switched things back to their original setup. I am back to either taking both bikes, or just my old bike with the triple crank. When I am training for a marathon I do at least two 20 mile runs as part of training. These runs serve two purposes. First they help get your body for the distance of the marathon and second they give you the mental confidence that you can go the distance. It is not necessary to do training runs just as long as the marathon, but you do want to get in some runs at least 75% of the distance. For the Everest Challenge, the real “challenge” to me is not the distance over the two days or the climbing on an individual day, but the back to back days of a lot of miles and a lot of climbing. A week ago I did a monster training ride on Saturday and wanted to see how it was to ride the next day and did a ride up Henry Coe. That was a good first test, but to get a better feel I felt doing two back to back significant rides would be better training. On Saturday I did the club’s long distance training ride and on Sunday I wrote with friends for what we call the Triple Crown (Metcalf/Quimby/Mt. Hamilton). Both days had about the same amount of miles and similar climbing, although the climbs on the 2nd day were steeper. In terms of mileage these rides are in the ball park of what I will need to do on the Everest Challenge, but the climbing is about 2/3 as much. On the first day I rode very hard because I was on a club ride and the others did not plan to ride again the next day. I would not want to try to ride this fast on the first day of the Everest Challenge. I paid the price the second day and had to ride much slower, but that still kept me with the other friends I was riding with. After trying to climb Henry Coe three days ago following the monster ride the day before, I wanted to see how well I could do today. 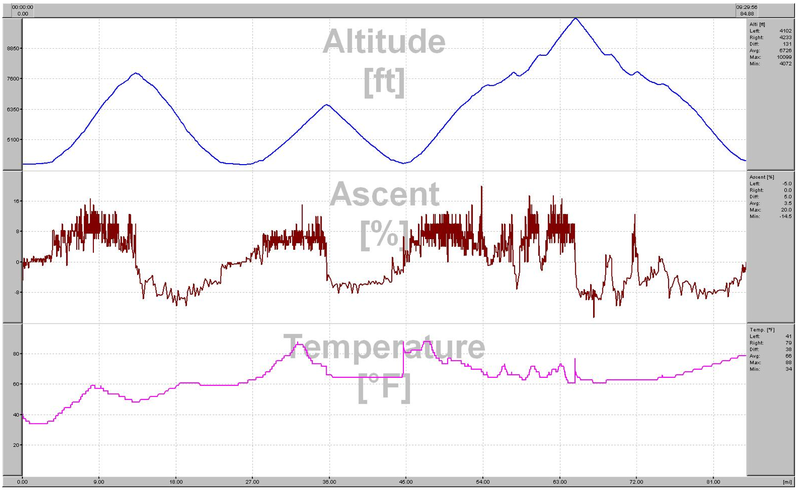 I was not really fresh since we had set a new best time up Metcalf yesterday on the tandem. But I was not as fatigued as I was on Sunday. I was chasing Doug R. all the way up. He can easily drop me on the hill and that is what he did today. Still I was happy with my time of 41:19, less than 4 minutes off my race time last year when my average heart rate was 168 all 6.7 miles. Also today we had ridden hard all the way from the bottom, including Thomas Grade so I was not rested at the start of the measured climb. After the ride Doug told me he was planning to do the Everest Challenge also. I said he could ride up with Eric and I and would be great to have a third person. Maybe Doug can place in our age group since I am sure I can’t. With only 11 days left before the Everest Challenge and 25 days to the Furnace Creek 508, I have moved into the final stages of my training. With these two major events only 13 days apart, I have been using a single training program, with the major emphasis on getting ready for the EC. I figure if I am ready for the Everest Challenge, I will be ready for the 508. The Everest Challenge will prove to be the most difficult cycling event I will ever compete in. I registered as a Master 55+. I wish they had a 60+ category but they jump to 65+. When people hit their sixties, as I have, you age faster than you do in your 30’s and 40’s so why not move to every 5 years? Last year I was training for the same event and decided the week before to cancel out for a couple of reasons. First the weather had turned very bad and I was looking at biking up to snow, with rain and cold on the descents. Second, I was going to compete in the Furnace Creek 508 two weeks later. Again I will be doing the 508 two weeks later but this year I am no longer a rookie in that event and know what to expect. For the Everest Challenge, Day 1 has 120 miles with 15,465 feet of climb and Day 2 has 86 miles with 13,570 feet of climbing. However the actual racing distance (excluding neutralized start and neutralized last descent after timing finish) is 92 miles for Day 1 and 61 miles for Day 2, or a total of 153 miles. I believe that the neutralized starts are included in the times, but not the descent after the last climb. For Day 1 the neutralized start is 8 miles and for Day 2 it is 3 miles. So the timed distance is 100 miles for Day 1 and 64 miles for Day 2. The times for 2007 are not valid due to a course change. For 2006, the time for my age group range from 12:40 (1st) to 18:04 (8th place), with 4 DNFs. Third place was 13:24. The difference between Day 1 and Day 2 was roughly 1:40. With a time of 14:46 it would not be possible for me to place. That is no surprise since this race attracts the best climbers for the entire state of California. Still I decided to enter as a race category because I want to get my time recorded. In 2003 they did have a 60+ category and in that year the best time for 60+ was 15:29:04. I guess that will be a target I will go after which should give me a little bragging right. So my target is under 15.5 hours. So far I am on track with my training. Here are a couple of training charts. I have one training program for both Everest Challenge that the 508 because they are only two weeks apart. The Everest Challenge occurs a the end of week 17 and the 508 at the end of week 19. Click to enlarge. Miles: Over the past 15 weeks I running about the same as last year and on plan. Climbing: For the last 15 weeks I am running head of last year and above plan. Recent Climbing: Compared with last year I have done more climbing in the recent weeks, closer to the EC. Yesterday I did a monster ride out to the junction (135 miles and 12,800 feet of climbing). Since the Everest Challenge is a two day event, with two monster days back to back, I wanted to see how well I could do today. The south county boys were going to ride up Metcalf, Quimby and Mt. Hamilton but that is what I did yesterday and I was not up to such a long ride. I thought doing Henry Coe would be a good test so I called Gary and we decided to make the climb. I could feel the effects of yesterday’s ride. I was able to climb reasonably well, considering I was fatigued. What I did notice is that I could not get my heart rate up above 150 and most of the time during the climb it was only in the mid 140’s. This was a clear sign of fatigue. I decided to time myself over the race portion of the climb. Last fall I had raced this section and wanted to see how I compared. I knew it would be about 10 minutes slower since 1) this was not a race today and 2) I was not fully recovered like I would be for a race. Here is how the times compered. You can see the big difference in average heart rate, which is why it took longer. However overall I was happy with my time and felt like I could a lot more climbing if I needed to. I did realize that for the Everest Challenge I need to back off a bit on the first day and be fully rested, at least for a couple of days, before even starting the event. It was only 5 days ago that we were in Utah and I rode up Alpine Loop to see the snow from a recent storm. I did not take a jacket and was very cold on the way down. Today’s long ride out to the junction was HOT HOT HOT. Kind of like out of the kettle into the fire. I was leading a long ride for the bike club. The official start was in San Jose, but I figured starting from Morgan Hill would be the same distance, please riders said they were going to meet us along the way. To meet meet the timing I would have had to start biking from home at 6:30 am, but it was still dark so I asked Ann to drive me 6 miles towards Morgan Hill and I started there, at about 6:55 am. It was warm enough, despite the early hour, that I did not need any arm warmers. Ten minutes later I met Gary F and we rode together up Monterey to Bailey. We then made our way over and did the first climb of the day, Metcalf. I did the climb slower than usual because I had a long ride ahead. We had to wait at the top for any riders to show up and then only two did. We then started down the backside and were met by Russ and Joe F. Not long after that Cindi S. was coming the other way and turned around to join the group. We made our way of to Quimby for the second climb. Quimby is a nasty climb of nearly 2,000 feet with some sections that approach 20% grade. I had not really tried to time the climb up there for years so I did push a bit harder to see how I was doing compared with several years ago. Since those prior times were all set on a short ride, I felt good with my time which was less than a minute off my best time ever and better than I ever did in 2004. Russ and Gary had gone ahead of me but the others were all behind. There was not waiting at the top of Quimby by the leaders so I headed down and to Mt. Hamilton road where I caught them getting water. We then had the long climb up to the top of Mt Hamilton. It was already getting hot. We passed Louise M. on the way up, she had started the climb earlier. Russ had reached the summit before anyone so Gary and I stopped just long enought to fill our water bottles then head down. Due to the heat our plan was to turn around at the bottom and make the climb up Mt. Hamilton before it got too hot. Gary, Russ and I stopped at the Isabel Creek to wait for others. Then we started to talk about going to the junciton, per the orignal plan. No one else showed up so we headed out to the junction, not realizing how hot it was going to be. I had a simple lunch, a turkey sandwich and some potato chips. Russ and Gary both had a big lunch with a lot of french fires. I thought I could never eat all those fires and climb up the backside. We didn’t take too long to eat because we knew the temperatures would continue to rise. We each bought a Gatorade to stick in our back pocket because we knew that two water bottles would not be enough to make it back to the summit in this heat. I ended up drinking mine on the spot then filled the bottle with water to carry. On the way back we saw a couple of cyclists headed in the same direction, pulled off the road resting in the shade. One yelled out that it was 112 degrees. I check my cyclometer and it was reading 112, although it tends to read high when in direct sunlight. But then my body was in direct sunlight! The three of us were biking together until the last climb before we descending back to Isabel Creek for the start of the big climb. Then Russ started to move ahead and Gary started to fall behind. As we started to climb up the backside of Mt. Hamilton, I slowed was gaining on Russ but I could no longer see Gary. I caught Russ as we approached the spring at the 3 mile mark (3 miles from the top) so we stopped there to splash some water on ourselves and cool off. We waitd for awhile and still no Gary. I started to worry about him since he is a faster climber than I am. A van was now coming up the hill so I flagged it down to see if they had seen a cyclists. As it was stopping I could see that Gary was in the van. I guess he had some issue so the driver offered to carry him to the top. Russ and I got back on our bikes and finished the climb to the summit. There we found Gary laying on the ground. He had become dehyrated, was cramping and even had the chills. I rush up to get him a cold drink and then he used some water to cool himself off. We knew we needed to wait for him to recover. Here is how fast I climbed the backside, but did stop at the spring, so I had some rest midway. Eventually he wanted to go ahead and bike so we all started down the hill. Then it was a climb back over Quimby. After reaching the San Jose Valley we could really feel the heat again, after a bit of cooler temperatures at 4,000 feet summit of Mt. Hamilton. Russ headed his own wan and Gary and I headed back to Morgan Hill. Gary was not feeling well so we stopped at a McDonlds to cool off and have some drinks. I wanted him to have more time to hyrate. We filled our water bottles with ice and water there and then headed back home. I dropped Gary off in Morgan Hill and then biked home. It was past 6 pm when I finally finished. I had biked 135 miles and climbed nearly 13,000 feet. My HRM showed only 11,900 feet, but last time I did this same route it was 12,700 feet. We’ve been under a high pressure system resulting in a reduction of accumulated gain. I will use 12,800 since I did an additional climb up Santa Terresa to Miller this time. 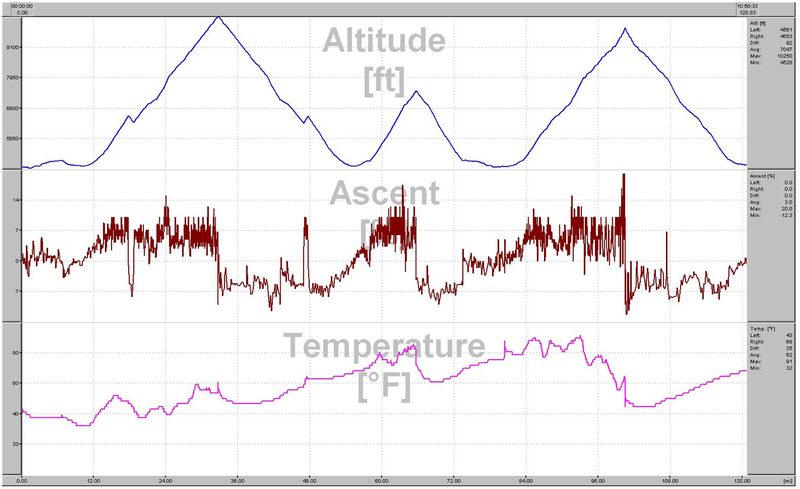 This was therefore the most climbing ever on a training ride. If I had done all five passes on the Death Ride, I would have biked 6 miles less and climbed 2,000 feet more, so this was some training ride. I took a quick shower and Ann and I went out to dinner. I was felling fine, despite the hot weather, long distance and considerable climbing. I was more confident that I was ready for the Everest Challenge. This is the profile of the ride. August is almost over and my training for the big events coming up is in the final stages. First up will be the Everest Challenge on September 20/21. This is a two day California/Nevada USCF State Climbing Championship. Each day has about 15,000 feet of climbing. Doing that on back to back days will be the big challenge. I had hoped to do this event last year but the weather turned very bad and I was worried about the doing the Furnace Creek 508 two weeks later so I ended up canceling. This year I will again be doing the same Furnace Creek 508, but I am more comfortable with that event and feel that the two weeks in between it and the Everest Challenge is sufficient time to recover. I have built an 18 week training plan to do both events, using the Everest Challenge on week 17 to get ready for the FC 508. Now that I have finished week 14, with three weeks to go to the Everest Challenge, here is an update of my training status. You can see that I am on plan for both miles and feet of climbing. I have another big ride scheduled for this coming Saturday, then it will be taper time. My climbing is not quite as much as last year when I did the Death Ride and Climb to Kaiser events, but it is still on my plan. I still need to lose some more weight, however.